Home » Latest News » Welcome, Bishop Les Tomlinson! It is official – Sandhurst has a new Bishop! Bishop Les Tomlinson will be installed as our new Bishop at a ceremony in Bendigo on March 1. 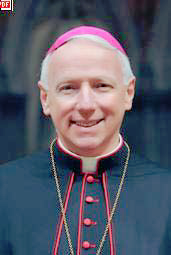 Bishop Les is currently an Auxiliary Bishop in Melbourne where he is the Vicar General. No doubt there will be opportunities to meet and greet Bishop Les over the coming months. His predecessor, Bishop Joe, was passionate in his commitment to and involvement with young people in the diocese – let’s hope and pray for something similar from Bishop Les, albeit in his own style and manner. In celebrating the appointment of our new Bishop, we should also reflect on the great work of Monsignor Frank Marriott who has been holding the fort in an acting capacity since the untimely death of Bishop Joe. “I am very humbled by the confidence that His Holiness Pope Benedict XVI and his advisers have shown in me, by appointing me as Bishop of Sandhurst. I am greatly delighted to accept this appointment. Having been born and brought up in Mildura, just north of the Sandhurst Diocese, I am no stranger to country life. In reflecting on over almost forty years of my Priesthood, I believe that the richest and most fulfilling aspect of my ministry has been my work as a pastor. I look forward to being bishop and pastor of the clergy and people of the Diocese of Sandhurst. Just over twelve months ago we were all deeply saddened by the sudden and untimely death of my predecessor, Bishop Joe Grech. Bishop Joe’s gifts to Sandhurst were many, but significantly amongst them was his unmistakable enthusiasm for and deep commitment to the Lord Jesus. As each of us is different, I pray that I can make my contribution to the Diocese through my gifts, to further build the life of Christ in the Sandhurst Diocese.